Linear interpolation is a weighted average of 2 neighbors. Consider the 1D domain between the 2 neighbors. This line is divided into 2 segments by the point in question. The weight of each neighbor is given by the length of the opposite segment, as a fraction of the whole line. Bilinear interpolation is a weighted average of 4 neighbors. Consider the 2D domain between the 4 neighbors. This rectangle is divided into 4 sub-rectangles by the point in question. The weight of each neighbor is given by the area of the opposite sub-rectangle, as a fraction of the whole rectangle. Trilinear interpolation is a weighted average of 8 neighbors. Consider the 3D domain between the 8 neighbors. This box is divided into 8 sub-boxes by the point in question. The weight of each neighbor is given by the volume of the opposite sub-box, as a fraction of the whole box. This is easy to visualize but hard to draw – so sorry no diagram. N-linear interpolation is a weighted average of 2N neighbors. Consider the N-dimensional domain between the 2N neighbors. This hyper-box is divided into 2N sub-hyper-boxes by the point in question. 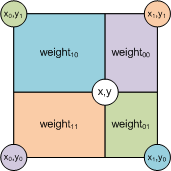 The weight of each neighbor is given by the hyper-volume of the opposite sub-hyper-box, as a fraction of the whole hyper-box. 1) explain that “f” is the value (or set of values) for that point. 2) the formula has a result, with is f(x), i.e. the value (or set of values) of “f” for the point x. 3) your formulas don’t work if x1 = x0 or y1 = y0, i.e. these case require a fallback on n-1 interpolation or whatever. Thanks. I’ve incorporated number 1 and 2, and anyone concerned about special cases can come and find number 3 in your comment.